Students at LHS get to experience the opportunities of a big school, yet enjoy a smaller, personalized environment where they're encouraged to get involved. The wide variety of activities are genuinely accessible to each student. That's just one thing that makes Lutheran High School unique. Also, students are safe – not just from some of the dangers of our world, but also safe to explore and grow their faith. Students are taught to be leaders in their school, in their families, and in their communities. Take some time to explore our website for some of the possibilities we offer for students to experience outside of the classroom. LHS competes in the Indiana State Academic Super Bowl, hosting teams of students who compete in subjects such as Math, Science, English, Literature, Spelling, and more. Lutheran High School boasts the State Championship 2016 with runner-up position in 2017. Prospects look strong for 2018! At LHS, 71% of students participate in athletics. We have 19 athletic teams that students can join, including soccer, basketball, volleyball, American football, baseball (boys), softball (girls), track and field, bowling, and more! Click here for information on our athletic program. Saints on Stage is a thriving program at LHS where students participate in two high quality performances per year, including one play in the fall and one musical in the spring. Past productions include Disney classics such as "Beauty and the Beast," "Cinderella," as well as American classics like "Our Town" and more. Click here for more information on the Saints on Stage. Lutheran offers opportunities for Fine Arts such as choir, band, and traditional art classes. The LHS Chamber Choir goes on tour each Spring to various locations around the country and Canada, including New Orleans, LA, NYC, NY, Philadelphia, PA as well as local performances. The band also goes on tour in the Spring. 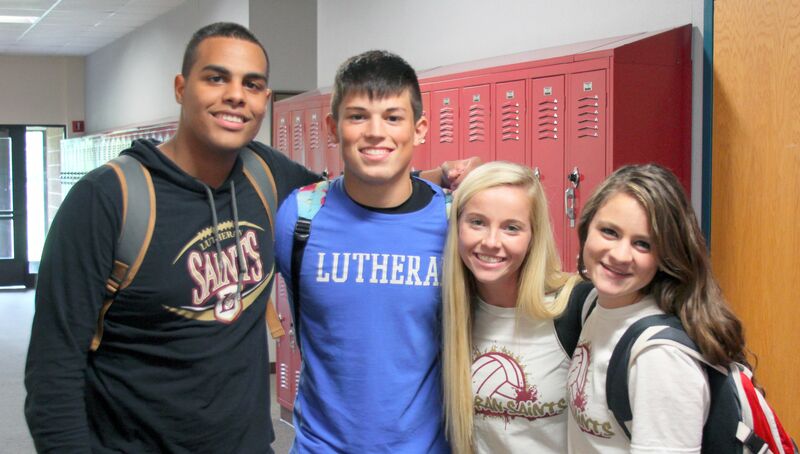 Lutheran Saints enjoy a wide variety of clubs and activities. Some examples of clubs that students join are Robotics, Sports Media, Movies, Intramural Sports, Student Council, Model UN, National Honor Society, and more! "[Lutheran High School] is a smaller school, meaning that you have a better connection with teachers. There are excellent academic opportunities along with the option of joining many different sports teams and clubs. It is also a great opportunity to learn in a Christ-centered environment." "Make sure you enjoy the present, and are not buried in your phone. Enjoy relationships and go to prom. Fall in love – not only with a boy or girl, but also with art, or music, or your faith, or nature. God has created such a beautiful world for you to see so go enjoy it!"